Last time we gave you guys some tips for partying in style on Cinco de Mayo and since it's concert/festival season I thought it would be dope to share some tips on how to keep it cool and cozy during the concert. As a member of Nike's 2018 Air Society, your girl went to see Kendrick Lamar and TDE courtesy of the great people at Nike Chicago. You ready? Let's get it. If you guys didn't know I'm participating in Chicago's Nike Air Society this summer and this Friday would of made week 3 of our five week journey but, I was surprised with tickets to the TDE Championship Tour with Ab-Soul, Jay Rock, ScHoolBoy Q and of course Kendrick Lamar. You know I couldn't miss the opportunity to see them kill it. If you missed my Sneaker Diary with Air Max 270, you can read it here. 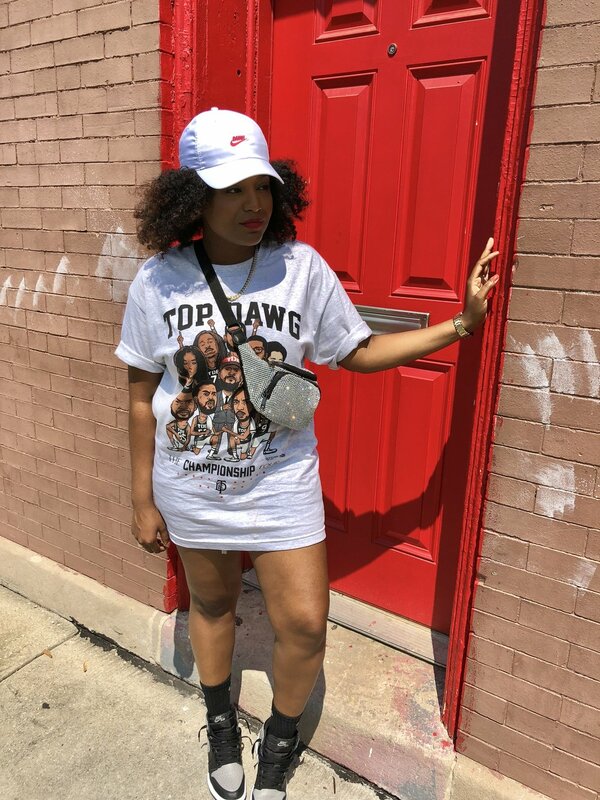 It was a very hot weekend in Chicago and I knew the concert was going to be outdoors but I really wanted to wear my Nike x TDE Tour Merch which also happened to be long sleeve. To help provide some balance I added some denim shorts, my DAMN Nike swoosh hat with the Air Max 97's. Keeping everything light is a must when attending a concert outside. I used to be against the fanny pack trend but I find this to be very beneficial for a concert. Being hands-free is important, throw your keys, phone, lipgloss, sunglasses and whatver else you have and throw it around your waist or chest. I'm also a fan of oversized t-shirts too during shows, remember it's hot, so less is more but keep it classy. A huge thank you to Nike Chicago for providing me with an awesome experience. Most of you don't know that I used to blog about music for about four years and I've been a huge fan of Kendrick so, I provided you guys with a Spotify playlist with some of my favorites from the TDE crew - even though some of the cuts can't be found on streaming services.